You are here: Home / Blog / Lab Supplies & Equipment / Can a Rainin Multichannel Reduce RSI? Can a Rainin Multichannel Reduce RSI? Rainin multichannel pipettes and Capp multichannels have found a way to combat the unspoken danger of pipetting, repetitive strain injury (RSI). Researchers and Manufactures are constantly looking to reduce or remove the risk of RSI. Some of the simplest solutions include modifying the mold of a pipette and reducing the weight, but there are two solutions that are rarely considered. The force it takes to mount a tip and the intensity of the plunger force highly contributes to the risk of RSI. This risk can be doubled when using a multichannel pipette, as it takes more force to manipulate all of the channels. We will examine two methods to combat these problems found in Rainin multichannel and Capp multichannels. One of the more common known solutions to reduce RSI comes from Rainin’s patented LiteTouch-System. Reducing wrist strain is accomplished by modification of two parts of the pipette. In Rainin single and multichannel pipettes, the plunger force needed to aspirate and dispense has been decreased significantly. By reducing the plunger force of a multichannel pipette, you relieve stress from the thumb and partially from the wrist. The second focus of Rainin multichannel pipettes LiteTouch-system is the shape of the tip mounts. 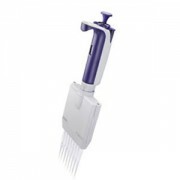 Uniquely designed for Rainin pipettes, the tip mounts are molded into a flat cylindrical shape instead of the typical cone mount. This change in design permits for easy mounting with minimum force, allowing for reduced strain in the hand and wrist. Rainin’s LiteTouch-System does reduce the risk of repetitive strain injury, but there are some drawbacks to the system. By changing the mold of the Rainin multichannel and single channel pipette’s tip mount, they have also made their pipettes compatible only with specialized pipette tips. This leaves researchers pigeonholed into purchasing tips from few select retailers. Along with this specialization, the Rainin pipettes are generally more expensive than other pipettes, unnecessarily decreasing researcher’s available spending. 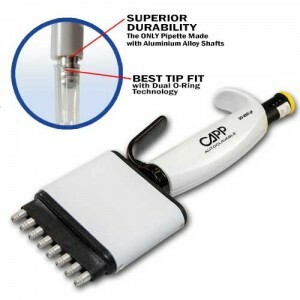 To combat repetitive strain injury, without the raise in price or specialization in tips, Capp has designed their pipettes with two major differences. Capp pipettes first focus on the stress induced by the tip injector. Instead of having to use your thumb to force a tips off the pipette, Capp has designed a hand grip lever. By using your entire hand to eject tips, you reduce the amount of pressure on a single point. This reduces the stress on your fingers, allowing for a longer period of pipetting. Like Rainin’s LiteTouch-System, Capp’s pipette tips also differ from the general design. Instead of morphing the mold of the pipette tips though, Capp’s simple solution was to use two silicone o-rings on the tips of their pipettes. These o-rings can be found on all models of Capp pipettes, which reduces the risk of RSI by allowing for an effortless tip mount. Without the need for specialized tips, the pressure needed to mount the tips has been greatly reduced. These double o-rings have the added bonus of creating a perfect seal for your tips, increasing the accuracy and precision of your aspiration. As well-known enthusiasts of everything pipettes, we are very aware of the dangers that intense periods of pipetting can cause. Our number one goal is to provide an accurate and user friendly pipette. That’s why we are dedicated to providing pipettes that reduce the risk of injury. View our full line of Capp multichannel and single channel pipettes to reduce your risk of injury. https://solutions.pipette.com/wp-content/uploads/Multichannels-Rainin-XLS.jpg 300 300 Victoria Hosford https://solutions.pipette.com/wp-content/uploads/pipettecom-logo.png Victoria Hosford2016-03-29 09:53:252016-04-05 14:33:19Can a Rainin Multichannel Reduce RSI? CappAero 384 Multichannel Pipette – Increase Your Output Is the Gilson Neo Multichannel a True Standard?